Monday was Opening Day. Evidence of construction was still going on. Windows and doors being replaced, etc. 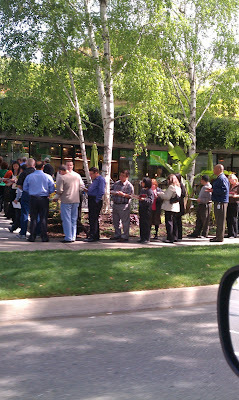 Word got out that there was free lunch for the opening. Then the CalPERS Board President and the CEO appeared around noon to welcome Freshii to the building. By then their audience was large – the line of customers was out the patio and down the block. I observed the chaos for a good half hour from the comfortable leather couches in their lounge/TV area. The wait was long, but then again, they were swamped. I was dismayed to see people really taking too much advantage of the generosity by serving themselves giant bowls of yogurt heaped with toppings. I returned later in the afternoon to see how they had survived. I had tweeted during the rush, “how does one turn off free food when the line goes down the block?” Eric was checking his emails and said that they did eventually have to go out and stop the line. I had wondered if they had run out of food. They were being cleaned out of some ingredients. Eric explained that in reality, the fire permit had not been cleared yet, and so he wasn’t allowed to ‘sell’ food. That was the reason for the giveaway. Let’s hope all the generous goodwill works out to return customers. I told him some of the things I noted – especially that our cafeteria looked just as busy as it always does. This was a concern about how much the Freshii would impact the café’s business. They overlap in menu for the salads, yogurt, and oatmeal. But Freshii doesn’t really have hot items and so the café will always have the advantage of entrée items, burgers, and pizzas. Today I arrived at work to see the windows and doors still being worked on. But I guess the inspection passed because it looked like they were serving customers inside. My suggestion for non-CalPERS employees would be to wait a week or two as they finish their last details of construction and get their sea legs. Or go in the evenings and on the weekend. So far the comments from my coworkers have been positive and the excitement is there. We are happy to have a new, healthy option readily available. Freshii is on the left side of the store and the Yogurtagogo machines and toppings are on the right. The cash registers are in the middle. 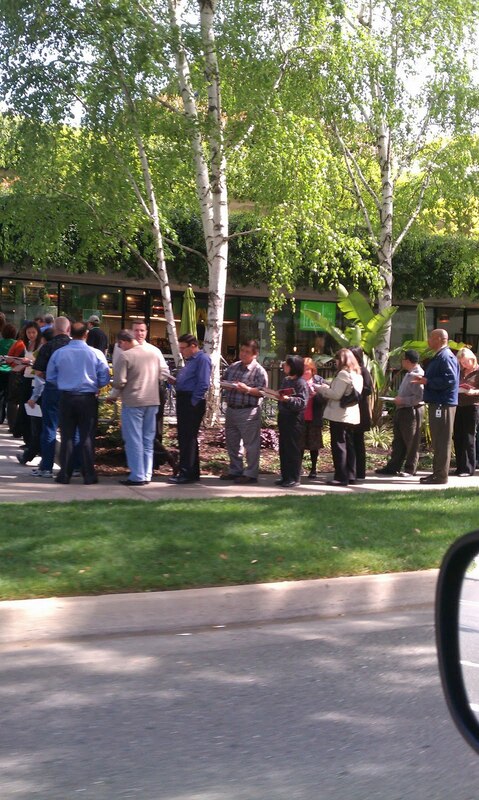 So if you are only there for yogurt, go straight to the right side and avoid the Freshii line. Online ordering and prepay will be up in the next day or so - avoid the line! They have a monthly frequency card. Eat 7 times, free meal. Another 6 times, another free meal. Another 5, another free meal. Of course that means you could possibly be eating there 21 times in a month - 3 of which are free. Yogurtagogo frequency cards will be valid here too. Ten yogurts and then a free one. There's a discount if you belong to a gym - more details on this later. Hours are 7 am to 9 pm. Special events (such as music) in the evenings and weekends will be upcoming. This location is the only Freshii with self-serve yogurt and will soon have a beer/wine license.